I’ve watched my mother host 29 Thanksgivings. This roughly equates to a collective 870 guests, a metric half-ton of turkey, and enough gravy to flood the Chicago suburbs. Anyone who can estimate the overall caloric intake deserves the Nobel Prize. A Midwestern Thanksgiving is a special thing, as so much of a host’s energy must be spent anticipating and accommodating a wide range of potentialities. Take the weather: My own lifetime has seen Thanksgiving Day range from 27 to 63 degrees Fahrenheit, a spread that allows for both slushy boots and sunburns. Yes, sunburns—we’re Irish, okay? “Irish” also means accommodating a crowd that’s ranged from 25 to 40 guests (sometimes cousins bring dates; sometimes the babies are kept at home), a differential of three tables of diners. And on any given year, the crowd’s age range might span four generations and eight decades, meaning that both accessibility and entertainment become heightened components of the operation. I’ve watched my mother every year as she performs this seamless calculus, and have absorbed what I hope is some secondhand prowess. Hosting a Midwestern gathering is a deeply gratifying exercise; you just have to think like a guest to do it right. As a gift to the most entertaining-averse among you, here are some prized learnings from my family’s hearth and home to yours. You never want to tell guests exactly what to do, but a big rug on the front porch piled high with others’ snow-caked Uggs and Wellies might send the message that you’re not too jazzed on all that sludge tracking through the house. Besides, who can get comfy while bound to wet, heavy footwear? Which brings us to the next tenet. That’s “Bring Your Own Slippers.” Not as an enforced rule or anything; just start the trend by showing up to family parties with cozy footwear in tow. It’s both a courtesy and a compliment: You keep the host’s floors slush-free and show them just how comfortable you’re made by their hospitality. The trend will gain traction among your cousins, and you’ll be in fuzzy slippers all night. Everyone wins! Piano benches and ottomans not only fulfill their duty as extra chairs, but also seem to delight the younger kids, who will all scramble to fill those seats first. Maybe forking up mashed potatoes from these tiny, upholstered pouf-thrones provides a transgressive thrill. Coolers full of beer, water, and soda: back porch. Wine, glassware, and corkscrews: on the sideboard. Appetizers: living room. Coats: on the bed in the guest bedroom. Trash/recycling: next to the sideboard, or in the hallway, or in the laundry room, or out back. Brought a dish of your own? The hostess will take that to the fridge for you; you just worry about getting yourself some chicken dip, which is far away, in the living room! Guests seem preternaturally attracted to the kitchen, and tend to drift toward it until the room is so packed that new arrivals must fold into the paper-thin crevices of free space that remain. It’s both a nuisance and a fire-code violation, and if left unchecked, these crowds will cause the kitchen to swell and burst into a shower of splintered wood, smashed brick, and stainless steel shrapnel. There’s a debate that rages in the far corners of foodie internet: Should dinner party guests be invited to contribute dishes of their own, or will this disrupt the harmonious composition of the meal the host has planned? I bite my thumb at the latter camp, at least when it comes to Thanksgiving dinner. It’s a time for belly-bursting comforts, not culinary mastery. There’s going to be an excess of everything: salty sides, starchy mains, sickly-sweet “salads” made primarily of marshmallow. The desserts will be disproportionately chocolate, and beverage offerings include beer, wine, and Baileys. 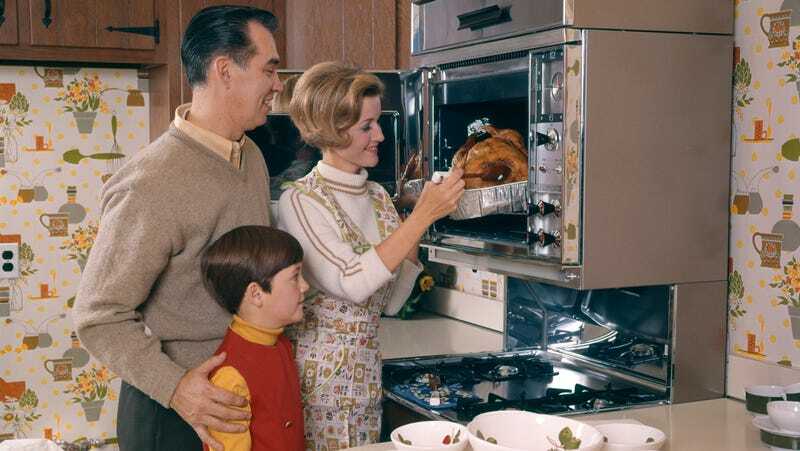 Thanksgiving is a day for family (whomever we embrace as such), and there’s nothing you wouldn’t do for family—even if that means forgoing an interesting new recipe because you know it won’t play as well as the cranberry sauce you’ve made every year since 1982. Bring Your Own Tupperware. In the interest of letting not one spoonful go to waste, guests should feel free to arrive armed with plastic tubs aplenty to fill up with their favorites as they head out the door. Alternatively, a host can take this opportunity to get rid of the many reusable Thai containers that have accumulated in their cabinets over the past year. My mom’s little stroke of genius, the Black Friday meal invites family and friends to head over after any potential shopping sprees for a lazy, casual afternoon complete with platters of reheated leftovers and as-yet-unsliced desserts. Because no holiday ought to last a single measly day. There are many more tricks up this Midwestern sleeve: serving hot appetizers in one of these, placing a dining table directly in front of the couch so diehards needn’t pull themselves away from football, and so on. But the only indispensable advice is this: Make Thanksgiving what you want it to be. Cling to the traditions that delight you, and not a single one that doesn’t. Define “family” and “dinner table” and “saying grace” and “side salad” however loosely befits your holiday. I promise your guests won’t leave feeling burned by the discord of multiple cheesy-potato sides. They likely love you too much to scrutinize, and they’ll drift off into a pleasant, starchy slumber as soon as they cross their own thresholds. Cheers to a party well thrown.